Sarsour was recently spotted at a large Chicago Muslim conference, and it’s there where she met with a board member of “American Muslims for Palestine,” who also happens to be a former member of the terrorist group, Hamas. While there, she posed for a picture with Salah Sarsour, a member of the Islamic Society of Milwaukee and former Hamas operative who was jailed in Israel in the 1990s because of his alleged work for the terrorist group. Submitted by Ckm4cuqB2q on Mon, 01/23/2017 - 11:45. Noisy, profane, anti-American (in their language) and very very spoiled. Most importantly, these noisy masses lost the lection, and thank god for that. And, stupendously important, they are totally irrelevant. Submitted by mike on Mon, 01/23/2017 - 11:27. 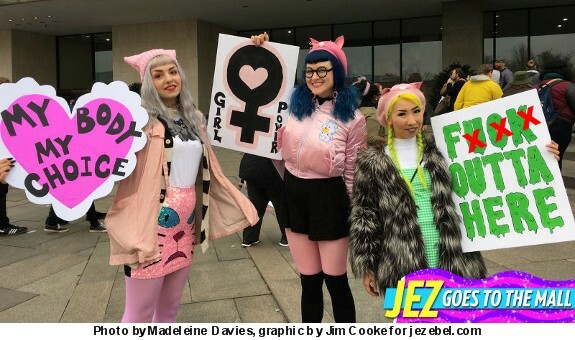 Is the one on the right especially ugly, or is she wearing a teenage Hillary mask? Either way, ugly is as ugly does, and these folks are proving Limbaugh's maxim that Femin[az]ism is for unattractive women who can't get a man.